Whether you have an iPhone or an Android phone, there’s an ultra-affordable smartwatch out there that you definitely need to check out. 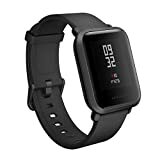 It’s called the Amazfit Bip Smartwatch by Huami, and it packs features you won’t find anywhere else at a fraction of the cost of leading models like the Apple Watch. Amazfit’s Bip offers all-day heart rate tracking, GPS, sleep-tracking, and so much more… plus it lasts for about 30 days on a single charge! That’s unheard of for any smartwatch, let alone a smartwatch you can pick up right now for just $61 thanks to an incredible Cyber Monday deal.